One Commander - менеджер файлов, какой сможете применить взамен проводника. Отличается от иных подобных продуктов тем, что значительно облегчает навигацию по вложенным папкам, независимо от глубины вложения. Совсем не прекращая их при появлении сбоев, совершит пакетные файловые операции, отобразит метаданные файлов мультимедиа, отмечает разными цветами новые и старые файлы и может сделать еще много нужных вещей. 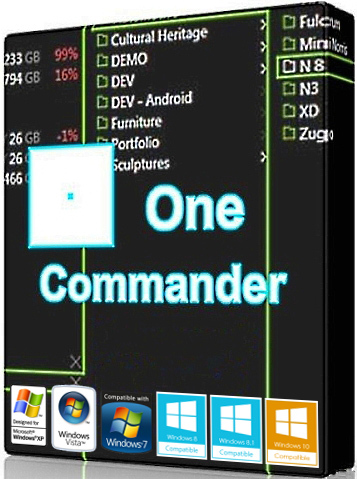 One Commander is a comprehensive and user-friendly piece of software developed to provide you with an alternate way of browsing, organizing and working with your files and folders, enabling you to execute batch operations with minimal effort. As a standalone application, it does not need to be installed on your computer in order to function properly, but it is recommended that you run it in Admin mode, as it will ensure a smoother performance. Consequently, One Commander can be stored and run from a portable storage device, such as a USB stick, enabling you to work with it on any compatible system, yet leaving no trace behind when deleted. The utility makes use of a tree view to organize your folders, subfolders and files, making sure that your current location is evident at all times. It supports multiple tabs, allowing you to easily switch between them and access the directories you need. Depending on the format of the files, some of them can be previewed inside One Commander, while others can be opened using your default software. You can create new folders or copy, move, rename, duplicate and delete items from your PC, cloud storage or removable drives. Furthermore, the ‘Drop List’ function helps you bring together files from distinct locations and process them simultaneously, letting you move them to a new directory or copy them. Batch processes are supported, thanks to the ‘Taskmaster’ component, which executes all operations and skips errors or other similar situations, allowing you to deal with them later. Helpful as it may be, it is quite clear that One Commander is still in its development stage, as it sometimes encounters crashes or freezes, meaning it still requires some work to improve its stability. However, the program proves quite appealing and shows promise for the future, particularly if it continues to resolve through its minor issues and increases its response speed.